Google announced a new consumer behaviour changing how people interact with their smartphones. According to Google North Americans are increasing their mobile sessions by 20%. Although, the actual length of those sessions are decreasing by 18%. What does thismeans for smartphone-user targeted content? The increase in smartphone usage comes with a need for immediacy of information. Micro-moments are instances where a consumer is looking for information on the fly. They search while tidying, waiting for a bus, even watching television. They want answers without having to to wait. In fact, 91% of users check their phones for information while performing a task. Marketers can capitalize on this new behaviour by being there, being relevant, and being helpful in the moment. Consumers are turning to their smartphones, rather than desktops, when they want answers. A known instance of this behaviour is while consumers watch television. “I want to know” moments generally happen when consumers are at the awareness stage of the buyer’s journey. To talk with Pedestal about how to engage consumers online click HERE. An I want to know moment can go like this. A consumer sees a commercial on television for a product or service that interests them. They look for more information on their phone. The search results push the user through the conversion funnel, or keeps them top of mind for later. This is an essential moment for marketers. They must be ready with educational and entertaining content. It is not the moment for advertisers to deliver a hard sell. But rather to nurture the consumer further through the engagement funnel. By providing content that answers the consumer’s questions when they are engaged, a brand can attract the awareness and interest of that consumer. Consumers are often looking for information when they’re on the go. If they are looking for restaurants, stores, products or services, marketers benefit by providing that information promptly. “Near me” searches (i.e., “okay Google, dentist near me”) have virtually doubled over the last year. Furthermore, 50% of smartphone users visit a business they find in a local search within 24 hours. Optimizing for local SEO and mobile functionality is essential for capturing the attention of consumers in the “I want to go” moment. Offer as much relevant information as possible. For example, a mobile site that includes hours, directions, reviews, a click-to-call button, and (if applicable) local inventory listings is more likely to attract consumers into the brick and mortar location. The internet has become the universal instruction manual, cookbook, and DIY guide. On Youtube, searches for “how to” videos are growing at an average annual rate of 70%. Marketers can capitalize on these moments. Leverage search data to anticipate what prospective customers are looking for. And use this information to publish educational content to YouTube. For example, a high-end grocery and/or kitchen wares company could upload a series of instructional cooking videos that features their brand of foods and cookware. Not only does this fulfill the need of the consumer, it will also develop brand awareness and affinity. Consumers today regard their smartphone as a personal shopping assistant. Users research products and reviews before making a purchase. 82% of smartphone users research while already in the store. Furthermore, 93% of consumers make a purchase after product research on their smartphone. Consumers search for reviews in a variety of online properties. Cnet is a popular site for electronics reviews. Amazon offers user reviews for a more generalized set of products. YouTube covers essentially anything a user might want to find. A recent study found that 65% of brands surveyed received a boost of interest after their Trueview ads are seen by users on Youtube. By delivering content in the “I want to buy” moments, brands engage consumers that are ready to buy. However, it is essential for brands to be there in the first place, in order to close the sale. 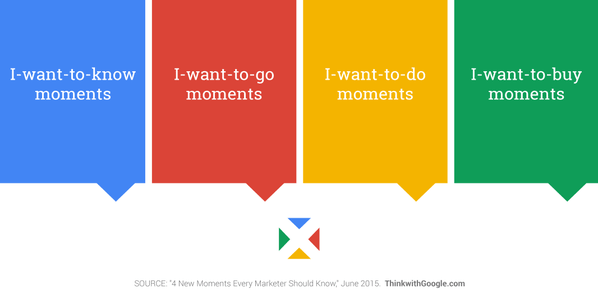 How marketers can prepare for micro-moments. Similar to keyword research, marketers need to try to anticipate how, and on what platforms, consumers are searching. Whether it is a Google search, a Youtube search, or even checking review sites, brands must be there in the moment. To make the most of micro-moments, marketers must strive to understand what it is specifically that their target is trying to accomplish with each search for information. Are they looking to buy, or are they looking to learn? What knowledge are they trying to gain, and for what purpose? Micro-moments are short bursts of inspiration or demand. Content must be readily available, quick to load, and easy to navigate in order to maintain consumer engagement. In the case of an “I want to buy” moment, the fewer steps necessary to complete the transaction, the better. Consumers navigate away from a page – and likely to a competitor’s – if their questions aren’t answered in a timely fashion. Market to the micro-moments that matter in 2019. Smartphones have affected the way consumers engage with content online. While our attention spans continue to shrink, our need for immediate information grows. Businesses that don’t adapt to this new consumer behaviour miss out on an ever-expanding share of the market. Learn more about marketing for micro-moments in 2019.